PYSELY, Czech Republic -- Given the fact that most of the Czech Republic's 100 or so golf courses have come online in the last 20 years, describing a course as being modern might not seem unique. But that's exactly the feel you get at the Prague area's newest golf course, Loreta Golf Club Pysely, located just south of the capital city in Pysely. Loreta, which opened this summer, has a modern clubhouse and restaurant, overlooking much of the golf course. And the golf course seems big, as new courses tend to be. 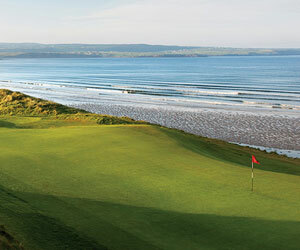 The fairways are wide, the water hazards are plentiful, and the greens, for the most part, are large as well. Designed by Austria-based architect Keith Preston, this par 72 plays to just more than 6,500 yards, but you never get the feel that this is a "shot-maker's course," a common euphemism for "tight." Instead, it's generous off the tee. And with five sets of tees, including two for women and a set for juniors, it's playable for all levels. Preston, who also designed Albatross Golf Club, considered one of the best golf courses in the Czech Republic, designed Loreta as a family course. In other words, it's a great course for kids as well as adults. Although the course has a modern feel, Loreta Golf Club Pysely still has qualities of traditional golf, especially in Europe. First off, powered golf carts -- or buggies as they call them in Europe -- haven't come into play yet. The course is just too new, said Jiri Novosad, the club manager and secretary, for the punishment it would take from such vehicles. So that means walking; and for the most part, this course is very walkable. It also feels much more mature than a course that's into its first season. In fact, it was only seeded a year ago, and like any Central European country, the growing season isn't that long. Its bentgrass greens are nearly perfect, and the fairways and roughs are pretty well grown in. Contributing to the course's mature feel is the fact that many trees that were on the property before have been left as part of the design. Instead of seedlings, the course has mature trees throughout, giving golfers the illusion that the course has been there much longer than it really has. "There are parts of this golf course that look like they have been here for ages," Novosad said. One of the unique aspects of Loreta Golf Club Pysely is that no two holes are alike. Some have many bunkers; some have nearly none. There are dogleg rights, lefts, long holes, short holes and holes with elevation change. For example, the par-3 11th plays at least two clubs downhill and offers something much of the golf course offers -- great views of the beautiful countryside. In fact, that's a theme throughout, especially from the clubhouse deck, which is perfect for a coffee, beer or light meal. The par 5s at Loreta Golf Club Pysely are particularly enticing. The second, at 550 yards, is one of the hardest holes on the course. This is one of the few areas where the fairway really does narrow in the landing zone, forcing players to think about what club they use off the tee and to layup for their third shot. Par on the second is a good score. The par-5 sixth is also intriguing. This dogleg right travels up a hill toward the clubhouse to a green well-protected by bunkers. At 520 yards from the tips, it is reachable in two for good players. And the par-5 18th is also a good risk-reward par 5. With a grove of trees pinching in the fairway, the 18th calls for a long, accurate tee shot to get a good look at the green on the second shot. For a course in its first year, Loreta Golf Club Pysely is in remarkably good shape and should only get better in a short amount of time. In fact, Novosad said that many improvements are on the way, including a new short-game area near the parking lot below the clubhouse, programs for juniors and a more comprehensive Web site. As it is, Loreta Golf Club Pysely has created a lot of buzz in the Czech golf world, which is obvious when you come to the course, given the full tee sheet (green fees in the $50-$70 range) and membership (the semi-private club already has 700 members). The course also offers a driving range, short-game area and lesson program. And even though powered carts aren't an option, powered push carts are, as well as non-powered pull carts. The restaurant is also a bonus, offering a full menu of authentic Czech cuisine as well as some traditional golf course snacks, too. And there is a stay-and-play component for select groups as the clubhouse/hotel has 10 rooms available. thank you for your visit at Loreta and your great article. I am very happy that you had a good time here. Thanks, Jiri. Great facility you have there.